Among all the types of online digital content, the video is one of the most significance and demanded mediums. To establish a business in this digital era, there is no alternative to video components to reach the target audience strongly. Simultaneously, the video is simply an awesome way to learn something new or enhance existing skills for an individual. To catch the target audience, choosing the right video sharing platform is a fact. There are a lot of people making money on YouTube. However, YouTube is not only the platform for your business related video to reach the widest audience all over the world. Here, we mention the consideration to select the perfect video sharing platform and making a professional and engaging video for your business. From social media, like Facebook, YouTube, Reddit, Instagram to television or online version of print media, everywhere you will see the presence of videos. So, imagine if your business could create professional, high quality videos in house! When creating your first video, you may think that what will be the purpose of my edit video? Video production is essential for interacting with customers. It’s no long just a TV format. Rather, it’s a medium that can reach many more people. In today’s culture, people would rather watch videos that read. No more ado. Let’s reveal the technique for the beginners. Do you want to take your video production skill beginning to the pro level? If yes, this article is for you. Here, in this article, we reveal the secret to make a pro video for your business. In most of the cases, a shaky cam indicates that you are an amateur. If you record live sports or event, then it is acceptable. But in fact of every video, it will ruin your works completely. Yes, to get rid of this situation you can use a tripod. But it is not a permanent solution. Dependence on the tripod hampers the journey to becoming a pro video editor. You can use a tripod during your probationary period. There some tips and tricks to avoid a tripod. When you hold the camera just fit your body position in a comfortable area so that your breath can not affect the location of the camera. Zooming at every shot and panning across the horizon is a widespread tendency for the newbies. The consequences of either result make the audience uncomfortable. During recording the action scene, let it naturally go and dominate on the marketing video. When you make unnecessary zoom and pan, the attention of your audience will drop. Just ensure the close shots. By following these processes, the video will look cleaner and more professional. Zooming and Panning present for providing extra facilities to the professional. When you apply these functions, make sure that you have enough reasons to use it. For example, during the recording of the dynamic event like cricket, use those features to focus on the ball. Even the professional videographers forget to record the audio or monitoring the quality of sound during recording. So, imagine the condition of the freshers. If you neglect the audio function of your video, it will be a silent piece. Who loves to enjoy silent video clips on this day? Ridiculous, Huh! If you do something like that your video is likely ruined 99.99%. So, ensure the position of the microphone during recording. Simultaneously, you have to ensure that you use a good quality microphone. Background noise is another concern for the videographers. But the good news is when you use a quality microphone it will filter the noise from itself. Amazing! Isn’t it? However, during the post-production noise, wind and other unnecessary sound sources should be edited for good outcome. If it is possible to keep the microphone closer to the interviewee. This is the professional way to create customer testimonial videos and other promotional content. It helps to avoid recording unnecessary sounds. You know, any annoying sounds can make a vital interview wholly ruined. A professional videographer has a good combination of the right handled camera or camcorder and microphone. It is not just enough to own this equipment. You have to learn the proper use of them. If you are at the very beginner level, it does not mandatory have all the gears. You can start what you have. Just begin your journey. The final output of a video largely depends on the perspective of recording. Angle is essential for some compelling reason. Let us consider the light effect. Suppose, you hold your camera focus on the light source. What will be the result in this case? Your whole effort will be ruined for the presence of extreme brightness. So, you should be careful about the focus and angle of the camera. The intermediate phase of post-production is editing. Many of us think that editing is the process of rearranging and cut the unnecessary part of the video. You will get a lot of freemium and premium video editing software online. You should select an editing software according to your level. Some of the programs will integrate directly with your viral marketing software. If you are at the very initial stage, you should use freemium software. On the other hand, if you are in a mounting position then go for the pro software. Pro software allows you a variety of convenient and you can make your video more professional than others. For the beginner level, you can use free video platforms. Those are entirely free to apply for the beginner level. When you are confident enough, you can use Adobe premiere pro or other exclusive video editing software. Hope, this brief article will help you to understand the basic fundamentals of creating videos for your business. Follow these simple steps to create a high quality video for business. Hold the camera steady yourself or with a tripod. Don’t zoom in and out too much. Prioritize audio quality while using the right equipment. Then, shoot from a professional angle and edit for engaging content. 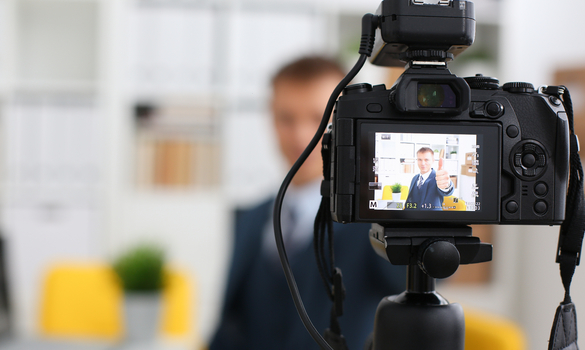 These steps will have you producing professional videos for your business.